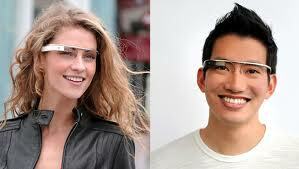 Google Glasses–Project Glass–Internet Head–Google Goggles–maybe you’ve seen them. The space-age specks enabling you to go anywhere with the internet at your fingertips and eyeballs (assuming you want that) tend to elicit strong responses, polarizing many into camps of thought like heck yeah can’t wait to get mine to those who claim it a sure sign of the end of the world. My opinion is closer to the heck yeah camp. What are your thoughts? Since the scope of this blog is typically for Indie authors and all things e-publishing, one of my questions was if people would eventually read this way. Seems logical enough. Think you could read an ebook with Google Glasses? Certainly someone will. If so, might theses goggles make Kindles and other devices obsolete just a short time after the majority of readers finally accept them? Probably not. By then, readers might complain that they simply prefer the old-fashioned feeling of hard plastic and e-ink in their hands. There’s a Google Plus follow page for Project Glass, and yes, they are verified, go figure. Project Glass, really? Why can’t Google brainiacs come up with a decent name right off the bat? Remember their ebook store that came out–Google Editions, which was a dumb name too so they changed it to something really clever–Google Ebooks. Seriously, they need to get a writer on payroll. Google Goggles perhaps? Have a feeling they’re fighting that one tooth and nail. Seems like just yesterday I was playing Classic Electronic Football that had tiny red lines representing players. Got to admit, it’s hard to imagine what another 35 years of technology could bring. One thing’s for sure in the here and now; several other R & D departments are probably scrambling to put something together comparable to Project Glass and fast. Apple? How about it? 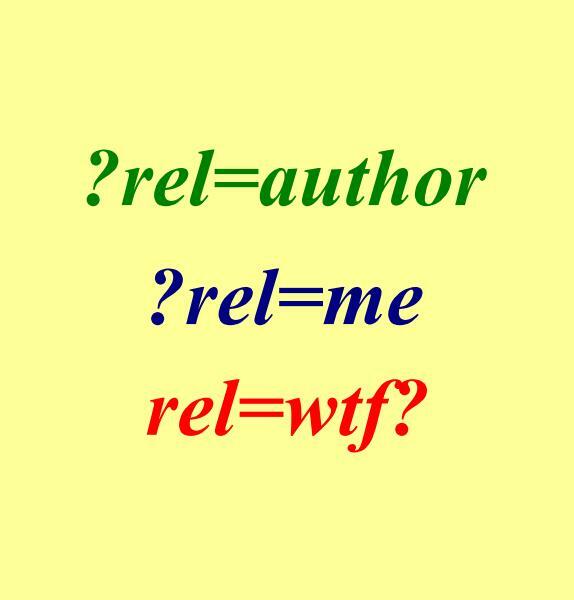 ?rel=me and ?rel=author has left some of us asking, rel=wtf? This should be easier as my solution in the final paragraph reveals. For sites and blogs with single authors, it’s extremely important to jump through the rel=author hoop for verifying webpages to your Google Plus profile page. The tag, rel=author, defines authorship. Okay, so what’s in it for me, you might ask? Answer: your photo may get listed next to the search results of your page, may being the operative word. Aha, that’s what this is all about: getting your smiling mug on page one so surfers will click your link! This tag can feel elusive especially since Google seems to continually tweak their instructions on how to make it, but it simply means that anyone who is a contributor to a website or blog and also has a Google Plus profile can follow a few steps to make Google aware of the connection. Since they’re the king of global internet search, as soon as I learned of this feature I raced to all of my sites and added the ?rel=author code (though not correctly the first time). How do rel=me and rel=author tags get inserted? There are actually a few ways to accomplish the connection and then one main way to check that it’s working. The first thing you’ll need to do is create a Google Plus account with a recognizable face shot as your main profile image. Sorry, no dogs, family reunions or animations for the main profile photo. Notice if you click on either of the latter links they direct you to the same G+ page, https://plus.google.com/117850331447734054313/. Of course, in all of the above examples you’ll need to substitute your profile number and profile name where I have inserted mine. This rel=author tag can be added to the <head> section, or a sidebar widget (like a G+ badge) or to signature text, or to the footer, pretty much anywhere. My form of overkill was to add some everywhere just to be on the safe side. 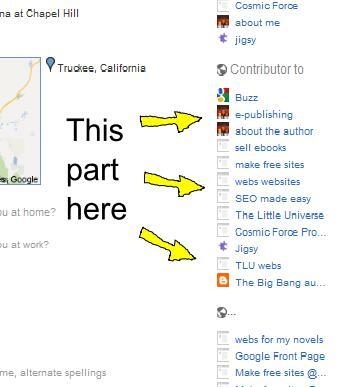 All that really matters is the “Contributor To” links point from your Google Plus Profile page to your websites, and the rel=author tags from your sites point back to your Google Profile page. That’s how Google sees the connection and verifies that you are both the webmaster and person behind the Google Plus profile. Next you can check your work to see if the link is being recognized by Google by visiting the Rich Snippets Testing Tool – http://www.google.com/webmasters/tools/richsnippets. Enter the URL address and click the Preview button. If you see your profile photo and a green line that says, “Verified: Authorship markup is verified for this page,” then you’ve got it and it should appear as this image below. If not, you can redo the previous steps or try some other methods. Now, what about this rel=me business? Fortunately, all 10 of my sites were verified (I’ll explain below) without even adding rel=me, so this tag still feels elusive and delivers some of the more varied explanations by the experts. (However, rel=me has been around for quite some time as an element of XFN, which is a solution for identity consolidation.) From the consensus, rel=me seems most important for people who contribute to websites but are not the sole contributors to the sites, or for active bloggers who post with the rel=me tag that points to their “About me” page which points to Google Profile page. Confused? Perfect, you must be paying attention. The ?rel=me tag can be used from any article and ultimately points back to the Google Plus Profile even if indirectly. If you post an article on another site and have an “author bio” on that site, your post can contain a rel=author tag that links to your “author bio” page that links with rel=me back to your Google Plus Profile (as in <a rel=”me” href=”https://plus.google.com/117850331447734054313/”&gt;). Hence Google sees the connection has been made. Good for bloggers who write multiple posts pointing to their own “About me” page or writers who moonlight and have an “author bio” page at someone else’s site. Still confused? It’s okay; I was too. 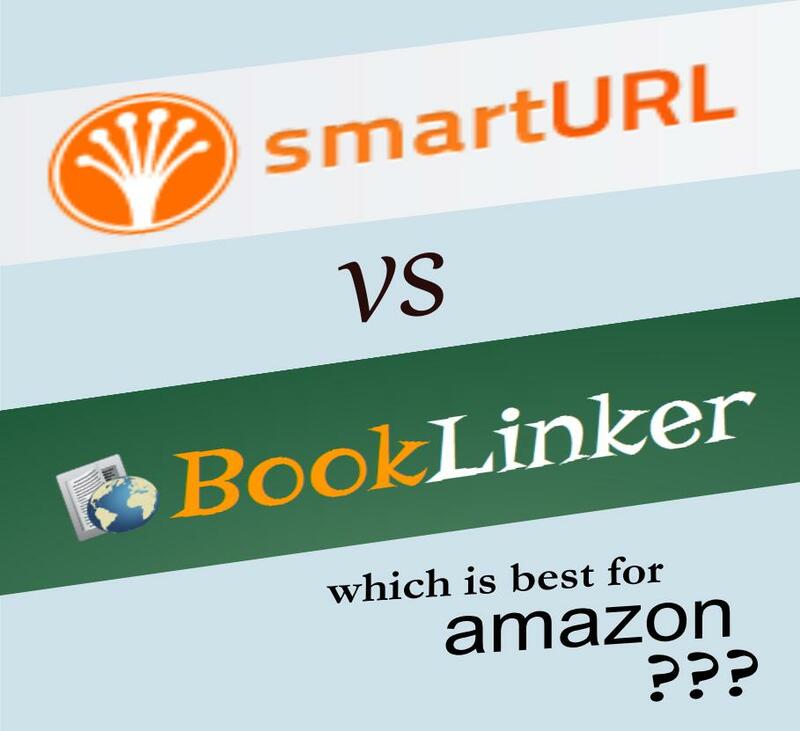 Support for this from Google can be found here – http://support.google.com/webmasters/bin/answer.py?hl=en&answer=1229920. On the right-hand side, click the Contributor to box, and add all the sites you write for. Next, click the Work box. Click the New contact info box (the last in the list, and type the email address you use for the sites you write for. In the list to the left of the email address you just added, click Email. Click Save, and then click Done editing. Repeat for every email address you want to add. On your profile, click Verify next to the email address you just added. Once you’ve finished and also Verified Authorship Markup with the Rich Snippets Testing Tool, fill out this form to complete the procedure – https://spreadsheets.google.com/spreadsheet/viewform?formkey=dHdCLVRwcTlvOWFKQXhNbEgtbE10QVE6MQ&ndplr=1. In my opinion, this could be a whole lot easier because Google has long perfected the method of verifying that we are webmasters of our sites by simply giving us a unique ID to insert in the site with either meta data or html code and then click the verify button at Webmaster Central. Boom, done, it proves we’re the webmaster. Couldn’t this be how they do our “Contributor To” option? Google could simply generate a long and unique ID number for our Google Plus “Contributor To” page. Then we could simply add that unique ID (or hyperlink to it for invisibility sake) to any article, blog post or website that we contribute to and tah-dah. If our “Contributor To” ID is unique, and since we’re the only ones who can Edit that section for adding the sites that we contribute to… then anywhere we put that ID and also add the site to our “Contributor List” would solve this problem. My solution is similar to what they’re doing, just with a few less steps involved, namely eliminating the need for both rel=author and rel=me. Hopefully this solution would also eliminate a lot of rel=wtf? For Indie authors who could use help with cover design, interior formatting, marketing or a variety of related aspects to the e-publishing business, oDesk is one place to look. While this blog generally focuses on doing everything possible for free to sell ebooks and paperbacks, there is an epilogue called Cheating With Money for certain authors and times where it makes sense to hire out. Although the Cheating With Money chapter could easily morph into an entire book all its own, oDesk will be added to the next updated version (January 2012) of How to Make, Market and Sell Ebooks All for Free. What is oDesk? It’s a free to join, online community of business owners and subcontractors who can connect and work together. Jobs can be large or small, full-time or just an hour. Professionals in web development, software, multi-media, mobile web, sales & marketing, translation, administrative support, general office and much more can be listed for both job opportunities and employment wanted. oDesk takes a 10% cut on every job, so factor that into the equation if you’re looking for work. Business owners seeking help can post jobs and receive contacts from perspective workers with resumes, examples, references, etc. There are tons of people out there so don’t be surprised to receive dozens of replies in little time. Many of the candidates who do the work are not from the US, which often keeps the prices extremely competitive (low). Pay can be hourly or fixed price. There are feedback ratings similar to eBay for both parties and even a screenshot of the people working every 10 minutes on your project to keep things on the up and up. For people who are looking for work, simply sign up through the Find Work page and fill out the forms. Answers to several dozen questions can be found at their FAQ’s page. This oDesk looks like a pretty smart place for certain jobs. The main ones Indie authors often inquire about are cover design and formatting. My guess is oDesk will have plenty of specialists in those fields. Smashwords also has a list of cover designers and formatting help that can be had by emailing list@smashwords.com. If any readers have experience using oDesk, we’d love to hear about it in the comments section.